After a long layoff from SSB racing, THR driver Lee Niffenegger returned to action at Gateway International Raceway (GIR) with the 2008 National Championship-winning Honda Racing / HPD BFGoodrich Tires Honda Civic Si. With a win at GIR, Lee could wrap up the Southern Pacific Division Showroom Stock B championship and pick up momentum in preparation for defending the National Championship at Road America in September. 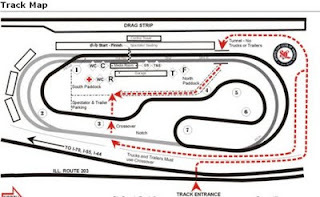 While Gateway is primarily known for the NASCAR-sanctioned races on its oval, the SCCA uses both the oval and infield road course to make up what is known as a "roval" course among road-racing participants. The weekend started with a practice session on Saturday morning that allowed Lee to become reacquainted with the Gateway course and work on setting tire pressures for qualifying and the race. Qualifying for the National took place Sunday morning. Lee chose to go with "sticker" BFG R1 tires on the front of his Civic Si in order to claim the pole position over Spec Miata stalwart Jim Drago, who had built a new Mazda to compete in SSB. Both Niffenegger and Drago went under the existing track record in qualifying and the two were closely followed by a Mini Cooper S and Pontiac Solstice ZOK, showing great diversity of platforms in the class. Unfortunately, the showdown between the horsepower of the Civic and the handling of the Mazda never materialized, due to engine trouble on Drago's car. The race took place late Sunday afternoon, with temperatures in the high 80's and humid. The conditions were very taxing for both cars and drivers and created a greasy track that would demand smoothness and patience. The supercharged Mini of Ralph Porter got its typical excellent start,and was able to jump into second place behind Niffenegger’s Civic. Combining a track-record breaking circuit on Lap 2 and the consistent performance of the BFGoodrich R1 tires over the remaining laps, Lee was able to pull out and then maintain a six-to-10 second lead over the eventual second-place finisher, Dennis Aubochon in his Pontiac Solstice. The win at Gateway clinched the SoPac SSB Divisional Points title for Lee, and helps maintain momentum in the effort to defend the National Championship for himself, Honda , and BFGoodrich.